Microsoft Excel, and most other spreadsheet programs, have the capacity to automatically calculate facts and figures using formulas typed into the cell windows. One function of these formulas is to calculate the value of a given item, taking the price of an item and multiplying it based on the amount of it you need. For instance, a fuel value calculator could easily be added to a spreadsheet in order to lay out the amount of fuel necessary for a given project, and how much it will cost by increment to provide an instant total. 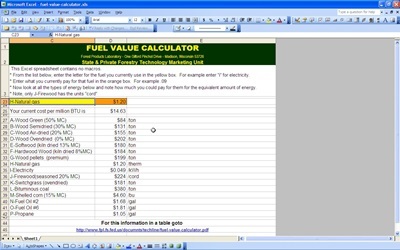 A fuel value calculator can be an extremely important part of any planning sheet. For instance, if someone is planning a road trip with friends or family, the fuel costs may change based on route and miles, thus showing which route is, in fact, the cheapest to take over the long haul. The same sheet could be very useful for independent truckers, or even for a trucking company, that needs to find the most effective route to get from point A to point B. Even air line companies, who need to make a certain amount of daily flights over a certain number of miles, need to calculate their fuel. Once you have the formula it’s very simple. All the user has to do is type in the value of the distance traveled, and the sheet calculates how much fuel will be necessary for that distance, and then provides a monetary value to purchase said fuel. Once that’s been done, all that’s left is to check the value for different routes, or even different vehicles, to see just how much it will cost someone to get where he or she needs to go at the end of the day.